Bali Spa Queen Rose is newly-opened spa at Jimbaran. 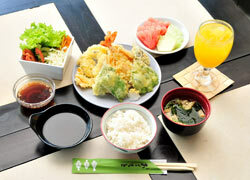 It is managed by Japanese owner and its seeks ultimate indulgence. 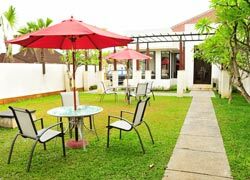 The menu has wide range such as Traditional Indonesian & Balinese treatment, Special menu for Bridal, Men's esthetic and Nail care. The private sauna is popular among residents in Bali. All in One Package includes pick-up, marine sport activities, lunch & spa treatment for 3 hours. It takes about 10 minutes to go to Queen Rose Spa from the marine sport company, so recommended you who want to do marine sport activities and take spa treatments in the same day. Aromatherapy is effective in improving blood circulation, and combined with lymphatic massage which is effective in breaking down visceral fat and subcutaneous fat around the stomach. Brazilian waxing is the epilation of pubic hair in and around the pubic region, commonly by women, by the use of wax. With certain styles of women's swimwear, pubic hair may become visible around the crotch area of a swimsuit. Visible pubic hair is widely culturally disapproved of and considered to be embarrassing, and so is at times removed. *Please do not take a long bath or use a swimming pool on that day. Waxing course for V.I.O lines. You can request lines you want to leave hair. The courses take about 30 - 60 minutes. These are available for men. The course recommended for anyone who are interested in opening business includes Brazilian wax experience and a technique lecture. Certificate will be provided after finishing the course. Traditional Balinese massage is an ancient healing tradition from Bali. 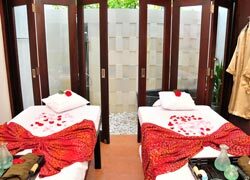 .Full body massage using long strokes, relaxing stretching, palm and acupressure of Balinese touch effective to improve blood circulation, relax body and mind. Body massage using essential oils derived from plants.Essentials help to relieve stress and discomfort to muscles and help you to relax. Queen massage is a full body massage where two superbly trained therapists simultaneously guide their hands to relief stress and melt away your tension. Warm Stone Massage is massage using heated basalt river stones or volcanic palm stones. Warm stone massage helps to create a positive energy flow throughout the body and is very relaxing. The energy within the stones is transferred to the client through massage. Reflexology is an energy-based healing art that works through the nervous system on feet and hands. Stimulating these reflexes can assist in bringing your body to a natural state of balance and help to improve blood circulation, relieve tension. Combine shiatsu massage and Thailand technique massage. It is effective to relief stress, melt away your tension and help to improve blood circulation. Lulur made from herbs and spice as ginger, rice powder, turmeric and sandal wood that can restore & condition the skin and soften & brighten the skin. Detoxifying and make skin healthy. (For dry and dehydrated skin. Whitening / a stain is considerably effective to be dark. In addition, the oxidation of the skin is controlled by anti-oxygenation of the catechin, and a pimple and inflammation seem to be improved. supplement skin with vitamin A / B and become the skin with the shine by a humidity retention effect. Ayuruveda treatment lead you r energy to correct balance and male healthy for your mind and body. Enjoy the full body treatment head to toe. Coffee scrub moisturizes your skin. Hard skin scrub includes Balinese massage. Raise a foot bath effect by exclusive foot bus and prevent an impression, crazing and remove the horny substance which became thick which it is the cause of the bad smell. 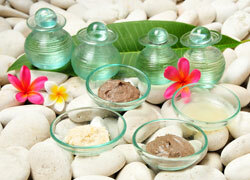 It is treatment softening a body and the stress that are easy to be tiring by massaging it. Facial for men. After face massage, clean the dirt of the pore. Cream bath using Korean ginseng. A hair-growth effect by the scalp massage and Queen Rose Original Cream Bath. Stimulating acupressure points on the hand that effective to improve blood circulation and relaxing your body,and nail care makes your nail beautiful and healthy. Including care for scarfskin that the foot nail of the extreme popularity gives the scarfskin circumference nourishment to a man these days, I polish the surface of the nail and promote upbringing of a healthy nail. Herbal bath using Indonesian herbs which is effective in relieving muscle pain and rejuvenate your skin. Braiding child’s hair in small three strands. Depend on the length, it takes about 1hour to finish. One color nail for children. Choices of 10 colors are available. Make beautiful imitation tattoo on children’s arm and back. Imitation tattoo will disappear in a few days. Face cleansing & face, neck and shoulder massage. Facial using original eucalyptus lotion. Treatment uses natural products as honey, cucumber, carrot, avocado, etc. Treatment begins with cleaning skin and then massage, steam and at last fresh fruit moisturizer. This package includes hand and arm massage. Javanese traditional head massage. Wash your hair with shampoo, scalp massage moisture treatment with herbs, fruits, etc, and steamed with cream bath cream. Hair and scalp treatment massage. Relieve neck stiffness and tired eyes. A traditional Indian Ayurvedic treatment. The warm medicated oil is poured continually down over your third eye in the centre of forehead to bring clarity and peace to spirit and both body and mind. Recommended for those with stress and tension. Booking for Queen Rose Spa "Last Day 8 hours Plan," please transfer the payment of discount price to the designated bank account 14 days prior of the reserved day. We cannot accept booking request if the lasting days until the reserved day were less than 14 days. We follow the spa cancellation regulation, so we are sorry for your inconvenience and thank you for your understanding. Period of 2014/5/3～7、8/13～18、2014/12/28～2015/1/5is high season. High season rates are subject to the above rates plus 15%. Departure Plan includes stay at villa 8 hours, treatment 2 hours, meal & airport transfer♪ Book at our company and get free treatment 30minutes. Effective improve blood circulation and detoxifying. Free pick-up service for min.2 people. Free pick-up for one person is available for treatment of total US＄70. Free pick-up service: Nusa Dua, Jimbaran, Kuta, Seminyak, Sanur area. Please contact us for Ubud, Tanah Lot & Uluwatu area. Treatments for children under age 12. You can use a Villa with Jacuzzi, shower and pool next to the Spa from 2 hours (one hour/＄15). All treatments include counseling before treatment, cold hand towel, welcome drink, drinks after treatments (choice of slimming tea, ginger tea, green tea & orange juice) &survey. The staffs can communicate in Japanese is the best thing!! The owner is Japanese, I could take spa treatments with ease at this spa. I took my children to spa and they played at kid`s room when both I and my husband had spa treatments. It`s also good to go to this spa alone. Thank you for your polite treatment. It was a really luxury healing day!★*☆♪It was the first time for me to have shirodhara. At first, it tickled me when the oil poured on my head, but after that I felt relaxed, and I fell asleep.